I am an ex-patriate Englishman, New Zealand citizen, war pensioner and veteran, having emigrated to New Zealand in May 1966. My wife and I arrived independently; we had not met at that stage. We have lived and worked in New Zealand for 46 years (since 1964) and 44 years (since 1966), respectively. 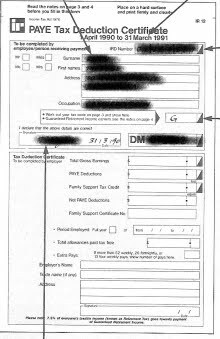 The reason I was given for having my New Zealand pension reduced by the amount of my small United Kingdom pension was that both schemes are identical and it would not be fair to New Zealand citizens who never left this country, if we ex-pats were to receive more than they did on retirement. I pointed out that the UK Scheme is not the same as the NZ scheme. It was not paid for out of taxes, I had a compulsory payment deducted from my weekly wages, and my employer also had a compulsory deduction to add to my contribution. The UK government made no contribution, but because they handled the funds, (i.e. invested the funds), New Zealand claims it is the same as its scheme, NZ Super. The tax form which shows that 5% and later 7.5% of the taxable income was dedicated to guaranteed superannuation. Immigrants and returning Kiwis paid into the scheme and have never seen a cent of this guaranteed retirement income. As said, my wife and I have lived and worked in New Zealand for 46 years and 44 years respectively. When we arrived here, there were two deductions from our salaries: an Income Tax Deduction and a Social Welfare Tax. The latter, we were informed, was for sickness and retirement benefits. I have learned since that 5% of our taxable income went into the New Zealand Pension Fund. At a later date, sometime in the 1980s, this was raised to 7.5% of our taxable income, and the name of the fund was changed to the GRI Fund (Guaranteed Retirement Income Fund). I have subsequently learned that there was no dedicated retirement fund. In fact, the contributions were deposited into the New Zealand Government Consolidated Account, and the Government of Robert Muldoon used those funds to fund his “Think Big” projects, many of which have since been mothballed. Over the years many MPs have told me that the superannuation payments are non-contributory and that they are paid out of the ordinary income tax receipts. I have provided them with a copy of an IR12 (Annual Income Tax Return) that states specifically that 7.5% of the taxable income is deposited in the GRI Fund. When the Government decided to change the name of the GRI Fund because they did not wish to guarantee it anymore, it became the NZ Superannuation Fund. At the same time they dropped off that one line on the IR12 form. The other point I have taken issue with is the Government telling us that the current NZ Superannuation scheme is not means-tested. I emphatically affirm that by reducing my New Zealand pension entitlement by the amount of my “Other Income”, i.e. my small UK pension, that in fact my NZ Super payments are means-tested. Civil servants, including the defence forces - who had compulsory deductions from their pay which were contributed to by the various Governments of the day – can receive the full amount of that “Pension-Superannuation-Annuity” on retirement, in addition to the NZ Superannuation payments if they meet the current criteria. My next bone of contention is that for most of our working lives in New Zealand my wife and I understood that upon retirement we would receive superannuation payments at 65% of the “Average After Tax Wage” of working New Zealanders. Until retirement we were treated as two individuals, we both paid income tax – including retirement tax - from our wages. Having raised eleven children between us (his, hers and our family), there was not much money left to think about putting more away for retirement. However, as I worked for Government Life Insurance Company for 13 years until retirement at age 60, I did contribute to their pension scheme because it was subsidised dollar for dollar. We assumed that we would have enough to live on comfortably on retirement. You can imagine our disappointment to find that the Government now calls us an “economic unit”, so we only get one pension between the two of us, despite having both contributed for most of our working lives. Of course, once senior citizens realised this, they headed for a divorce and continued to live together as husband and wife. The Labour Government rushed in to plug the loop-hole, and in the guise of equality for all brought in legislation so that gay couples, de-facto couples and civil union couples could all be treated the same as married couples. These minorities celebrated their new-found equality without realising that all it would mean to them was that they could be treated as “economic units” when they retired, meaning only one pension between the two of them. Over the last 20 years I have tried to get the media, politicians and RSAs to take up the call for justice for senior citizens but it always ends up in the “too hard” basket. I have warned MPs repeatedly that this problem will not go away, that there are more and more people annually who are going to find out the truth on retirement, and more and more disaffected people, but all to no avail. It is not just a matter of putting in place a universally accepted scheme for future generations; the current pensioners want justice done in their lifetime. We do not want handouts and endless forms if we have to beg for a loan for spectacles or teeth. We know that no Government would have the courage or the money to go back and reimburse all those pensioners who have lost part or all of their qualifying pensions. What we would accept is: as from tomorrow, let us keep our overseas pensions and receive our full New Zealand entitlement, preferably both of us. The Government can then cut out most of the accommodation supplements, special benefits or even medical reimbursements. It would not cost the Government as much as the doom and gloom number crunchers are forecasting. "My wife and I have lived and worked in New Zealand for 46 years and 44 years respectively." "We paid 7,5% of the taxable income into the GRI Fund." "Civil servants can receive the full amount of the 'Pension-Superannuation-Annuity' in addition to NZ Super." "We assumed that we would have enough to live on comfortably on retirement." "I have tried to get the media, politicians and RSAs to take up the call for justice for senior citizens but it always ends up in the 'too hard' basket." "We do not want handouts and endless forms if we have to beg for a loan for spectacles or teeth."